In a quiet off-mountain location just 6km from Moûtiers, Brides-les-Bains offers solid value accommodation and services. The low altitude makes road access to Brides, even in poor weather, among the easiest around. The Olympe gondola lift created for the 1992 Winter Olympics, provides direct, if not exactly instant access to Méribel and the world’s largest ski area. The 3 Vallées have something for everyone, and for groups which include non-skiers Brides (a long-established spa and wellbeing centre) might satisfy differing requirements. Once you step from the gondola in Méribel you have near-limitless skiing in the legendary Trois-Vallées, with Courchevel, Les Menuires, Saint-Martin de Belleville and even Val Thorens within skiing distance. 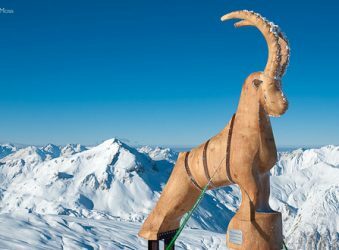 Méribel alone provides enough entertainment for skiers of most experience levels, and has an extensive area of gentle slopes perfect for novices and families. There are cruising blues and steeper reds on both sides of the valley, so if you need to keep your budget under control consider opting for a Méribel lift pass and saving the surrounding areas for your next visit. 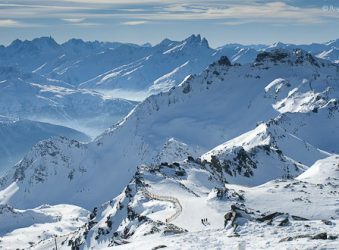 However, few experienced skiers will be able to resist skiing from Saulire into Courchevel, or enjoying long cruises down to Saint Martin de Belleville. 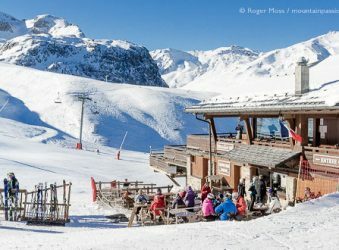 In good conditions, it’s perfectly possible to head to Les Menuires and Val Thorens before returning to Méribel in time for the last gondola descent to Brides-les-Bains. 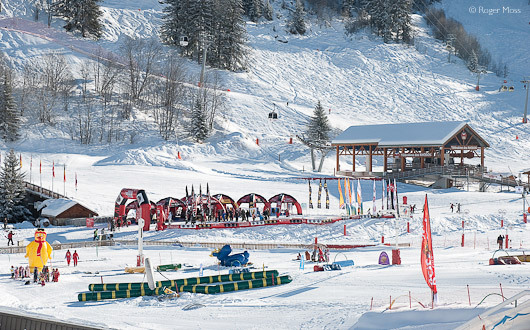 We ski Courchevel Moriond, a rising star of the French Alps with 150km of local terrain. If that's not enough, a great lift system lets you explore the vast 3 Valleys ski area, with a potential 600km of varied pistes to enjoy. Skiing on this side of the Three Valleys will bring savings on accommodation whilst having access to what is billed as the World's Largest Ski Area. Situated in the heart of the Trois-Vallées, this charming Alpine resort offers varied terrain and a chance to explore the world’s biggest ski area. 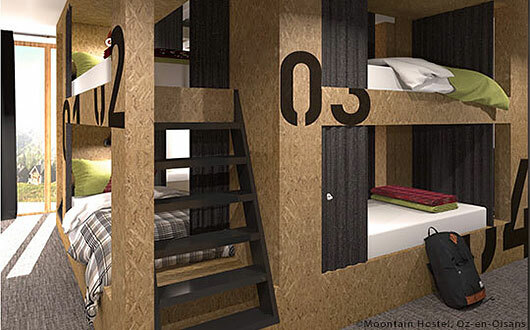 High-speed gondola access to Val Thorens and the fabulous Three Valleys have put this small village in the Maurienne valley on the map for keen, budget conscious skiers. 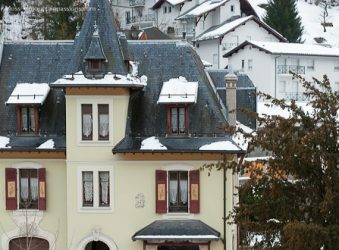 Situated in the Trois-Vallées (the world's biggest ski area), Brides-les-Bains offers great accommodation choices at low cost. As its name suggests, Brides-les-Bains is a long-established spa resort, and its fine buildings and grand hotels are testament to its former success. It wasn't until the gondola was installed that Brides also became known as a ski village. Already blessed with plentiful, quality accommodation and easy access, there are also several restaurants, a few bars and a handful of shops. New development on the outskirts of the village offers up to date self-catering apartments but it can't be denied that if you stay in Brides, you feel a long way from the main actions much higher up the mountain. Why go skiing in Brides-Les-Bains ? 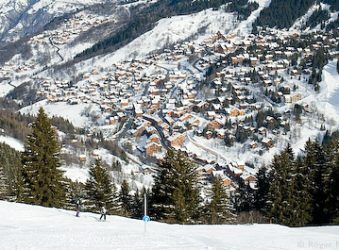 Budget-conscious skiers who want the thrill and prestige of big-mountain skiing in the 3 Valleys could find a bargain here, as long as they don't mind the 25-minute daily commute to and from Méribel. For those travelling by car it’s also reassuring to know that when heavy snowfalls are causing major problems for those getting in and out of purpose-built high-altitude ski villages, Brides’ valley location is likely to remain readily accessible. Finally, if you prefer a more relaxed approach you might well appreciate the high standard of hotel accommodation and the spa facilities (les Bains) in Brides. That said, families with young children who have ski-lesson appointments would perhaps find things less stressful in on-mountain accommodation. Plenty of choice from beginners fun zones to the DC Area 43, one of the best snowparks in Europe. 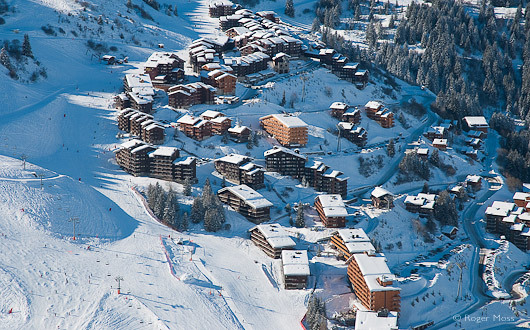 Choice of two sites in Meribel offering beginner to technical challenges. Disabled skiers could stay at Brides-les-Bains but would need to drive to Méribel to access the slopes. We recommend choosing on-mountain accommodation to enjoy all the Three Valleys has to offer. ESF Meribel has a full range of equipment and fully-qualified English-speaking instructors. Disabled skiers can access the ski area at various points for seated skiing throughout the Three Valleys domaine. Accessible toilets are situated at la Chaudanne, Méribel and Méribel-Mottaret Tourist Offices. Car parking spaces are available at all indoor car parks; 1 space at the Olympic Centre; 1 space at la Chaudanne; 2 spaces in Méribel-Mottaret. 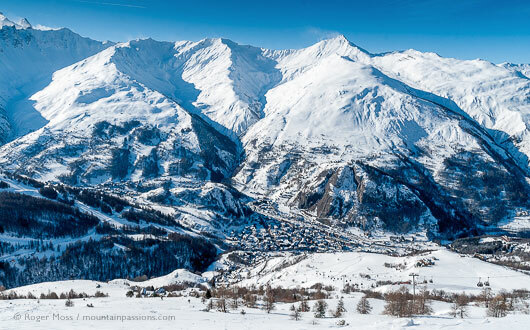 Access to high-altitude skiing in the world-renowned Trois-Vallées. The Grand Spa has been completely refurbished and offers wellbeing and beauty treatments alongside its' aqua-centre. Budget pricing plus premium skiing. Easy access - no mountain driving. Snow permitting, you can ski down to join the gondola in Les Allues. Trois-Vallées lift-pass offers a lot of skiing, but doesn't come cheap. 25min Olympe gondola ride means 50min less skiing per day. Not quite the cred-value of glitzier Méribel or Courchevel. If you have powder skis, you won't slot them into the gondola lift's outdated narrow ski carriers.Rather than struggle needlessly, ask the lift staff for help. Located in the heart of Brides-les-Bains, the Hotel was built in 1870 and is the largest hotel in Brides with 100 bedrooms all recently refurbished in a refreshing Scandinavian style. After returning from the ski slopes, relax in the Hotel pool and 5 Mondes spa. Plus, it's not far from the completely refurbished Grand Spa with special ski and wellbeing packages on offer. Getting to the gondola link to Méribel requires a 7-8 minute uphill walk, or you can use a shuttle bus service which stops at the Hotel entrance. The thermal spa at Brides-les-Bains is known for the effective slimming treatments and there's a host of packages designed to help you get back into shape. During the winter, the spa offers tailored skier massages as well as beauty, facial and body treatments. After a major refurbishment, Le Grand Spa re-opened in 2018 having added 600m2 of extra space and opening an aqua-fun pool, sauna, aromatherapy steam rooms, Jacuzzi, vitality pool etc. Find details at Thermes de Brides-les-Bains. Although not in the town centre this warm and welcoming restaurant more than lives up to its name, with a Savoyard ambience and a menu to match. Specialities include a selection of raviolis, regional dishes and pizzas. Several dishes suitable for vegetarians. Autoroute A43 Lyon / Albertville, then N90 to Moûtiers. Follow the signs for Vallée de Bozel/Brides-les-Bains. Other low cost flights are available from throughout the UK. Transfers are just 1¼ hours from Chambéry Savoie Mont Blanc. Lyon, Geneva, and Grenoble are all within 2 hours. Ski trains run throughout the winter and takes you direct into Moûtiers, just 6kms from Brides-les-Bains. After thirty-six hours of blizzard-like conditions, road access to many of the higher Savoyard ski villages is far from straightforward. Not that this need bother us unduly, since getting to Brides-les-Bains involves nothing more arduous than turning off a snow-free main road in Moûtiers and following the gentle curves of a sheltered valley. A mere 6km later we’ve arrived. This is too easy; can this really work as a credible ski base? That’s precisely what we’re here to find out. Getting to Brides-les-Bains involves nothing more arduous than turning off a snow-free main road in Moûtiers and following the gentle curves of a sheltered valley. A mere 6km later we’ve arrived. This is too easy; can this really work as a credible ski base? 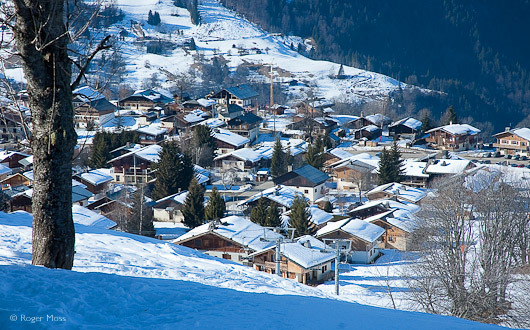 Méribel is renowned for its chalet-style ski village. There's a safe learner area in the heart of Méribel and near the top of the Brides-les-Bains gondola. All around the snow is still lying deep right down to the valley floor and billowing from the rooftops of the chalets and hotels. Meanwhile the first of another week’s skiers can be seen checking the village boutiques for sale bargains, hiring equipment or making their way up to the Olympe gondola office to buy their lift passes. 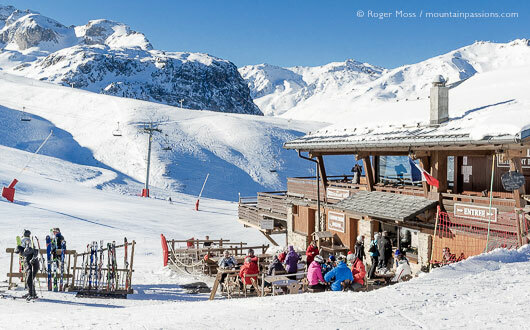 After checking into our hotel and transferring our skis to their lockers we too spend some time looking around and enjoying an extended lunch, during which we contemplate the Trois-Vallées piste-map. It’s an impressive sight, as befits the world’s largest linked ski area. Better still, if you ignore the minor detail that Brides lies some way below the other villages, we’re actually located right in the centre of things. At least that’s the theory; tomorrow we’ll see whether it still feels that way when we head up the mountain. Next morning finds things pretty icy underfoot, but we make it up to the gondola in our ski-boots without mishap and climb aboard. Billed as a scenic journey, it’s certainly that, floating hypnotically above a pristine snowscape and switching cables twice as it passes through intermediate stations at Les Allues and Le Raffort. Twenty-five minutes later we emerge in Méribel 1450, snap into our skis and gaze at the dazzling array of lifts departing in all directions. So much choice. So, where do we go first? Playing safe, we head for familiar territory aboard the gondola which will haul us up to Saulire, gateway to the neighbouring Courchevel sector. At the exposed summit the views are incredible, and so is the snow depth, judging by the heavy moguling on the steep Combe Saulire, before things flatten out for the wide, immaculately-groomed run into Courchevel 1850. A couple of minutes later we’re at 1550, little more than thirty minutes after arriving in Méribel. Having satisfied our curiosity on this point, we back-track to Saulire and spend the rest of the day getting to know the wealth of varied terrain in the Méribel sector. In addition to the expected Red-graded steeps we also find some calmer cruising Blues, a combination which should suit everyone. None of this should be news to us, as we first skied in Courchevel many years ago. 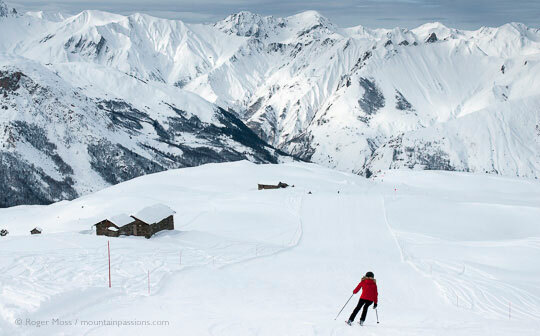 In those days, however, we’d been timid novices, and now find ourselves wondering why it’s taken us this long to finally ski the slopes in the neighbouring valley, above one of the world’s best-known ski villages. It’s good to be back. Brides-les-Bains is an easy, short drive from the autoroute at Moutiers. Good quality, spacious hotel accommodation costing less than higher up the mountain. Given good conditions you can ski almost all the way back to Brides-les-Bains via an entertaining Villages blue piste to Les Allues where you can pick up the gondola for the remainder of the journey. 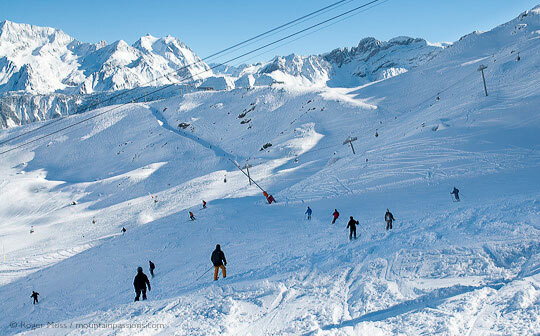 Skiers on the busy Combe Saulire piste between Courchevel and Méribel. 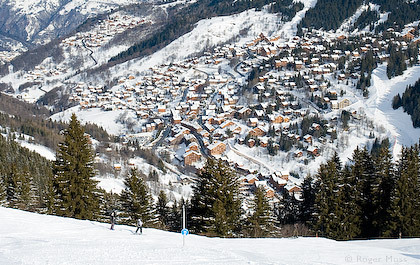 The remote-feeling Jerusalem piste is a swooping red run into St Martin de Belleville. The following day we emerge from Olympe, re-ski a couple of Red and Blue runs, then take the Tougnete gondola and onward chairlift. At the ridge we’re stopped in our tracks by one of the great Alpine panoramas. Somewhere hidden from view far below lies Saint Martin de Belleville, our target for this morning. Our chosen route (recommended by ski journalist and ultimate ski enthusiast Arnie Wilson) is the Red-graded Jerusalem, which looks nothing special on the piste-map. Skiing it, though, is enormous fun, starting with a couple of steep (and today moguled) sections, followed by a series of fast, roller coaster humps, before turning suddenly to join a long Blue run for the final drop into the village of Saint-Martin. After a relaxed restaurant lunch in the village square, we take the button-lift up past the novice area and climb aboard the chairlifts for the long ride back to Tougnete. By now weather conditions are deteriorating fast, making it unwise to head over to Les Menuires and maybe Val Thorens. Instead we drop down to more sheltered terrain above Mottaret and we fill in a few gaps in our knowledge for awhile, before schussing down to Méribel. Rather than taking the convenient option of joining the return gondola, we decide instead to extend our skiing time by following Villages, a long Blue-graded trail for as far as snow conditions allow. Not surprisingly, we have it virtually to ourselves, and glide in a trance-like state through a succession of silent landscapes, before the piste narrows, drops through a straggling tract of woodland and snow-cover peters-out just above Les Allues. A short walk later we’re joining the Olympe gondola at the village intermediate station for the final descent into Brides. It all works very smoothly – or would do if only the now outmoded ski-carriers on the gondolas were wide enough to take our modern but not overly-fat skis. After a struggle we’re aboard, settling back to enjoy the view and feeling rather pleased with our day’s skiing. So yes, the concept of Brides-les-Bains as a base for the Trois-Vallées works very well, if you’re happy to make the long gondola journey each day between the valley and the ski area. And in this case, ‘ski area’ really is something of an understatement.